Designed for marine use, fully complying with the international regulations, IMO MSC 112 (73), IEC 61108-1, etc. Easy operation with graphic mode display and function keys. Has totally 4 ports to output GPS data, which can be respectively configurated for baudrate and conbination of sentences. 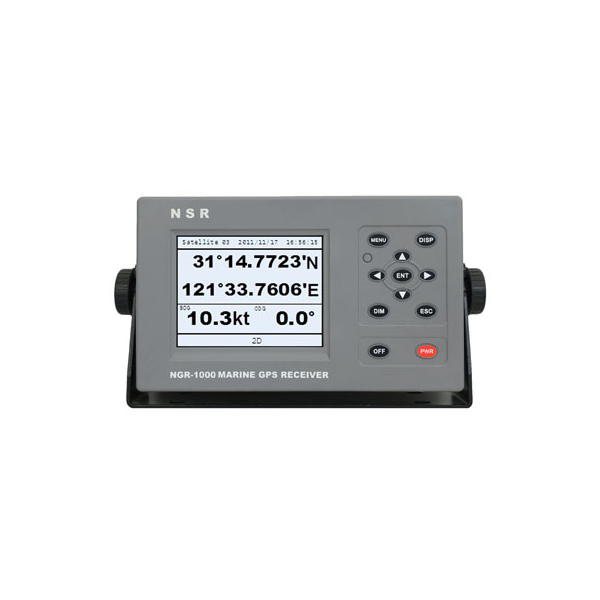 SPECIFICATIONS GPS Receiver: 50 discrete channels all-in-view, C/A code RX frequency: L1 (1575.42 MHz) Time to First Fix: 12 Second (Warm start) Tracking Velocity: Up to 900 kt Update Rate: 1 second Accuracy – GPS: 10 m (95%), SBAS supported – SOG: ± 0.2 kt (SOG _10 kt) – COG: ± 3° (SOG=1-17kt), ± 1° (SOG> 17kt) LCD 5.7 silver bright LCD with LED backlight Interface Output: GBS, GLL (L/L), VTG , ZDA, WPL, etc. Input: HDT, VBW , etc. Electrical Interfaces: RS-422 (4 outputs, 1 input) Power Supply DC24V (10V_38V) Size 145(H) x 264(W) x 80(D) mm Weight abt 0.4 kg.